Montenegrin-Croatian firm “Marin Med Montenegro d.o.o.”, which has been cooperating successfully with the Kotor General Hospital for two years, has donated an Automatic External Defibrillator (AED) to Hotel group ‘Budvanska rivijera” , which can be applied via simple means during emergency medical help for patients with heart failure. It’s a portable device used to deliver an electric shock in emergencies, and it will be put to use in the Hotel Palas in Petrovac. Another Automatic External Defiblirator, also a “Marin Med” donation, is soon to be installed at the Tivat airport as well. The first AED donation in the field of Montenegrin tourism was accomplished in partnership with the Montenegrin National Tourism Organization, at the end of the two-day Tourism forum which is held Petrovac, in the presence of numerous representatives of national and local tourism organizations in the region. The donation is worth four thousand euros. 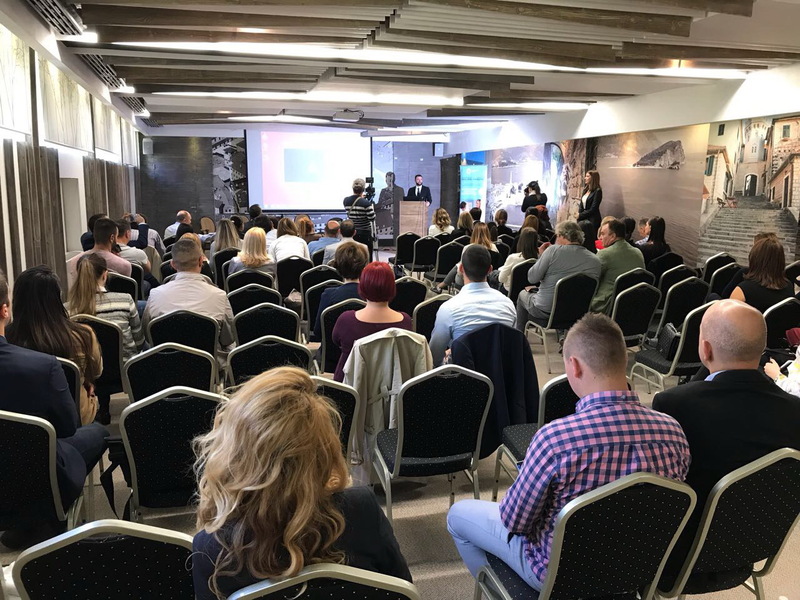 “As a socially responsible company we are aware of the necessity to improve the healthcare system in Montenegro, especially in locations that receive a high frequency of visits during the tourist season. By donating the AED device, we wanted to show that modern healthcare and first aid administration can be provided in almost any place, not just healthcare institutions. Sudden deaths caused by cardiac arrest are one of the most common causes of death in the world. Following the examples of developed countries, Montenegro too should embrace the trend of publically available AEDs on beaches, in hotels, malls and similar places. Therefore, we are looking at this donation only as an incentive for others to join this honorable cause and thank the National Tourism Organization for recognizing its significance” said Dr. Rikard Lenz, director of “Marin Med Croatia”. The Director of the NTO, Željka Radak Kukavičić assessed it is imperative for a destination to feel safe and secure for tourists. “Therefore, I am particularly pleased that the Budvanska rivijera hotel group is a proud owner of a device that can act as a preventive measure and keep the pace with the modern tourism trends. On one hand, we’d like it to be used as little as possible, on the other, given the rapid pace of modern life, I am aware that this is not a realistic expectation, and therefore we can all feel safer knowing that we have a device that can save human lives in our hotels” said Kukavičić. Representatives of the Zoll company, the importer of this type of AED, have demonstrated the application of the device, and trained the employees of the hotel Palas on how to use a defibrillator. When initiating first aid during a cardiac arrest, the key role is the cardiopulmonary reanimation that amateurs administer before the Emergency Medical Technician (EMT) arrives. Early reanimation and immediate defibrillation during the first two minutes result in a survival rate greater than 60%. If a defibrillator is applied in the first three to five minutes, the patient who was suffering from the condition is very likely to survive and recover. “Marin Med Montenegro” has been successfully cooperating with the Kotor General Hospital for two years on a project whose scope is to help provide healthcare to patients from cruise ships, but also other visitors to the Montenegrin coast. In this two-year cooperation with the Kotor General Hospital, “Marin Med” has invested more than 500.000,00 euros in the reconstruction of patient rooms, laboratories and the polyclinic part of the hospital. This has led to greatly enhanced conditions for the provision of healthcare services to foreign, and, to the largest extent, domestic patients alike. “Marin Med Montenegro” is the sponsor of the Montenegrin Olympic Committee for the upcoming Olympic Games in Tokyo in 2020, which will extend the partnership achieved last year during the Olympic Games in Brazil. The Montenegro branch of the company is part of the “Marin Med” firm from Dubrovnik, in the neighboring Croatia. “Marin Med Croatia” has a long tradition of providing first-class medical care for all tourists in Dubrovnik, especially travelers and crew members of large world cruisers. Anyone can face a situation where they find themselves next to a person who needs help with the use of an AED – in the street, workplace, in sports or in the family. If you are present when someone nearby collapses, loses consciousness, stops breathing, you too can be of help. Turn the AED device on and follow the instructions. The AED (automatic external defibrillator) is a small, portable device, simple to operate, with the task of delivering an electric charge to a person who is having a heart failure due to a rhythm disorder. In addition, today’s AEDs give users voiced and textual instructions according to the latest guidelines for basic life-sustaining procedures. The device performs the rhythm analysis with 100% accuracy and then recommends or doesn’t recommend defibrillation; the user is guided through the entire resuscitation process. The concept of using an automatic external defibrillator is very similar to the concept of using small handheld fire extinguishers that can be found in all public buildings, companies, etc. Compact, lightweight and simple to use, they serve as a means to extinguish the “initial fire” until the professionals, in this case – medical help, arrives. In 75-80% of the cases, sudden cardiac death begins with a heart rhythm disorder called ventricular fibrillation. In this case there is only one effective solution to stop the fibrillation and return the rhythm to its normal pace, and that is defibrillation – the administration of electric shock using a defibrillator. No other drug or procedure can be beneficial in such a case in the absence of a defibrillator. If the defibrillator is applied in the first 3-5 minutes, it is very likely that the person experiencing the described disorder will survive and recover successfully. Successful defibrillation is possible later, but every minute that passes from the onset of the disorder equates to a 7-10% drop in survival rate and successful recovery. Therefore, the life-saving success in such cases is directly dependent on the immediate availability of the defibrillator at the time of the sudden heart failure. It should be noted that in most cases, this type of cardiac arrest is the first symptom of heart disease. In other words, such cardiac arrest frequently occurs to people who were healthy up to that point, or at least looked like that to others. Because of this, it is almost impossible to foresee a time or place at which one could expect someone to have a heart attack.